An agritouristic complex immersed in a natural setting, surrounded by hills and mountains in the tranquil Candigliano Valley amid forests and pine groves with age old paths for trekking and mountain biking. It also features sulphuric water springs for invigorating showers and hydro-massage. Villa Cicchi is a splendid eighteenth century villa set within the travertine of a hill; its delightful structure catches the eye like a precious stone in a crown. With sophistication and elegance, it ushers in the city of Ascoli Piceno’s delicate atmosphere, and at the same time, the large collection of agricultural equipment laid out in the attractive wine cellar shows off its links with tradition. A farmhouse in an antique residence: a combination as unique as it successful. Baita 7 nani è l’ideale per coloro che vogliono trascorrere una piacevole vacanza immersi nella natura. La struttura è dotata di un ottimo ristorante pizzeria nonchè di maneggio dove è possibile imparare a cavalcare con guide esperte. Una vacanza via dalla pazza folla, fuori dalla città, nel comfort di una casa accogliente in aperta campagna, sulle dolci colline pesaresi. A dwelling for nuns in the remote past, Ca' Le Suore is a small rural hamlet at the centre of 70 hectare farm, with woods, meadows, vineyard and cultivated fields, in the foothills of the Apennines. A multi-purpose complex, offering the choice between a modern spa with rooms and health & fitness facilities, and ancient cottages located amidst nature between the countryside and the mountains, particularly suitable for large parties. An old parsonage dating back to the 1800s, carefully renovated and now a welcoming vacation village in an area dedicated to the production of the valued white truffle. A cluster of ancient buildings located on a verdant hill, with breathtaking views over the Candigliano River Valley and the mountains of the Montefeltro. La Locanda delle Saline opened in 2005 to welcome anyone who desires, for work or for pleasure, to discover the region of the Marche. Hidden in the countryside, yet just 3 km from the sea, 6 km from the airport and the A14 freeway exit, and 10 km from the port and Ancona’s central station, our farm is the perfect starting point for getting around the region. An elegant 18th century villa standing on the summit of a small hill, in a location so enchanting that you’ll think you can reach out and brush the tip of Camerino from the villa’s extensive grounds. Villa Fornari Relais offers top quality comfort and service in a refined and charming environment, rendered unique by a dash of familiarity and a hint of glamour. The village of Campofilone, founded in the Roman époque, overlooks a large country house set in the fields and surrounded by olive trees and a fruit orchard. There Mrs Lucia is awaiting for you. She decided in fact to make of her house more than a quiet B&B. You will be treated all sorts. You will enjoy quiet, and taste delicacies for breakfast. A stay in B&B dal Capo will make you happy! A small complex composed of three historic stone cottages and a swimming pool. It is situated at the centre of an estate of over 60 hectares of woods and cultivated fields. In the heart of Le Marche, immersed in a wide park and framed by mild and green hills of the Lanciano Castle and the impressive Sibylline Mountains, the Borgo Lanciano is the result of accurate and balanced renovation of old rural houses. Country House I Mori is located in the beautiful area called “Le Marche balcony”. The city of Cingoli is in fact so called as it is perched on a mount. The panorama there is stunning: the Maiella Mountains and even the coasts of Croatia can be seen. The country House is surrounded by oak trees and mulberry trees (Morus in Latin). The Country House has been named after them. Borgo San Vittore di Cingoli is located halfway between the Conero coastline and Mount San Vicino. Ancient noble palaces and castles seem to rest on the hills around. The valley stands still after being eroded for centuries by the Musone river. 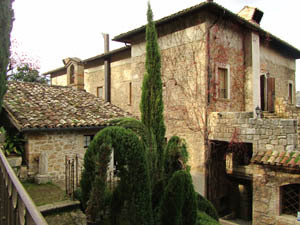 In the village of San Vittore an ancient Benedictine Abbey (XI century) has now been turned into Villa Della Rovere. Piantabete Country House is a XVII century rural dwelling featuring a particular landscape interest, which is situated above the Gerosa Lake facing the Sibillini Mountains chain. For those who are fascinated by ancient architectural structures, medieval walls, and breathtaking views, the Hotel il Giglio is just the place for an unforgettable stay. A former 18th century Augustinian Monastery adjacent to the Santuario di S. Maria Goretti, the Hotel il Giglio has conserved a sort of magic in the silence of its vast corridors, and the splendid panoramas enjoyed by the top floor. An unusual country house in stone for a Bed & Breakfast with holiday apartments, located on a gently rolling hill with lovely views across the valley of the Esino river. Built in 1905, this historic building used to be the central point for gathering, pressing and storing Verdicchio wine. La Distesa offers you a quiet country resort, brings you through naturalistic and oenological routes, makes you taste and learn the secrets of typical Italian cuisine and wines. La Distesa means discovering Verdicchio countryside, Jesi castles and hills. Many activities are organised to give the guests the chance to know and enjoy the Marche region and lifestyle. Villa Censi Mancia lies surrounded by the gentle green of mountains at the gates of the little town of Albacina, and astonishes everyone with a passion for art and history. This beautiful 18th Century residence is perfectly restored, and welcomes you to enjoy its marvellous frescoes, wooden marquetry furniture, art nouveau and Liberty embellishments, and the precious Roman artefacts displayed in the park. Villa Giulia is an elegant Napoleonic mansion. It is set in a century old park in the Fano countryside. The area is rich in olive groves, vineyards and crops. 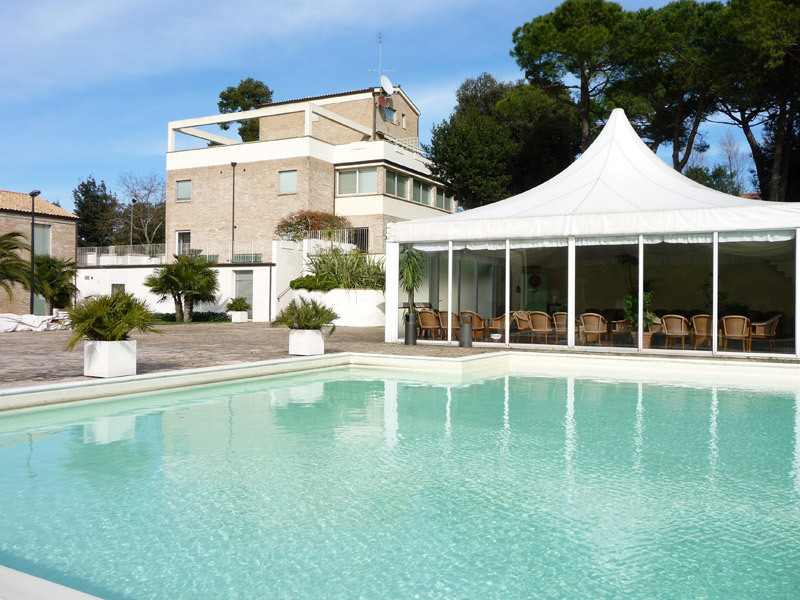 Villa Giulia is just 10 minutes from Fano and Pesaro coastline. The place faces the Adriatic Sea on one side. The other looks at the town of Fano and to its port. If the delicate scent of the wild rose cheers you up…if summer tastes like wheat or looks like the bright red poppy… choose Agriturismo Fiore di Campo and find the lodging that best suits your feelings. Each of the six rooms has been decorated inspiring to six different flowers of different colours. The quarters are really cosy and carefully laid. Agriturismo Fiore di Campo is also a agricultural business and produces high quality organic olive oil. In the historical centre of a delightful medieval town, Fermo, on the top of a hill (the sea to one side and the Sibillini Mountains to the other, and only 7km from the beach) is Palazzo Romani Adami. This historical residence is full of charm and offers accommodation both as a luxury Bed & Breakfast (with self-contained suites) and as a Holiday Home. 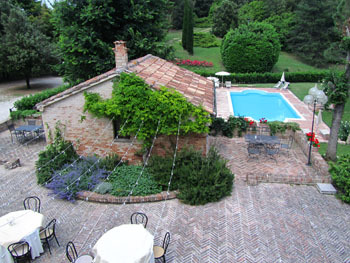 The Country House Pelliccetto is set on a panoramic hill in the Fermo area. It is just 10km from the seaside. The ancient farm has been turned into a cosy and quiet hideaway far from the hustle and bustle of the town. If you love the seaside and old towns, this is the place to go. In the heart of the old town, Villa Vinci overlooks the west side of the esplanade of Girfalco, opposite the Cathedral, on the top of the hill, Mount Sàbulo, where the city lies. It is a rare example, at least in the Marche, of an urban and non-rural villa, that therefore does not rely on a farm property or the surrounding countryside. Casa Centofinestreis a typical Le Marche farmhouse. It is the perfect place where to spend a relaxing holiday enjoying peace and quiet. It is far from the hustle and bustle of everyday life, but half way from the seaside and the mountains. 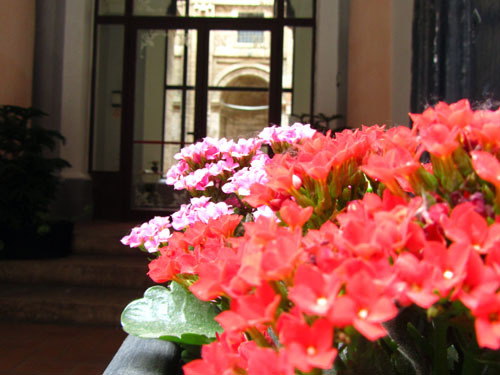 Torretta sul Borgo is a fascinating B&B set among the alleys of Grottammare small town centre. It is the perfect place to rest after a day at the seaside. Wide and cosy house for holidays in the area of Parco Nazionale dei Monti Sibillini, in search of feasts and events, to scout the nature, history and gastronomy of Marche. 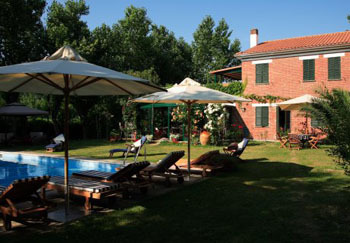 Agriturismo La Pieve will greet you in an ancient farm. It is an oasis far from the hustle and bustle of the city. Nature there offers enchanting views everyday. San Francesco Hotel enjoys spectacular views: on one side, the late Renaissance masterpiece that is the Loreto’s Basilica, the principal location of the Marian religion; on the other, the blue sea, awarded the Blue Flag for the clearness of its water. And if that isn’t enough, the structure itself of the hotel, a spacious convent dating back to the ‘50s that has been skilfully renovated. Borgo Sorbatti is set half way between the sea and the mountains, between the Ascoli and Macerata district. It fully embodies the deepest quality of Le Marche, that can be summed up in a sentence: “Italy in a region”. Borgo Sorbatti and its neighbourhood are in fact a miniature of Le Marche themselves. Country House Acquaviva is set in Loro Piceno, half way between the Adriatic sea and the Appeninne mountains. It is located about 430m above sea level. The grounds around the Country House are cultivated in fruit orchard, vineyards, olive grove and kitchen garden. The place is beautifully exposed South with stunning views on the SIbillini mountains, Laga mountains and the small hamlets of the Macerata and Fermo provinces. The Agriturismo Floriani Compagnoni is located in the heart of the region and only 2 Km from the centre of Macerata on the panoramic hill of Montanello, the Floriani is within easy reach of numerous historic and artistic towns throughout the territory. The Agriturismo Floriani is located in the heart of the region and only 2 Km from the centre of Macerata on the panoramic hill of Montanello, the Floriani is within easy reach of numerous historic and artistic towns throughout the territory. B&B La Moja is a cosy B&B in Vallesina. It has been set up in a small town dwelling with front garden. 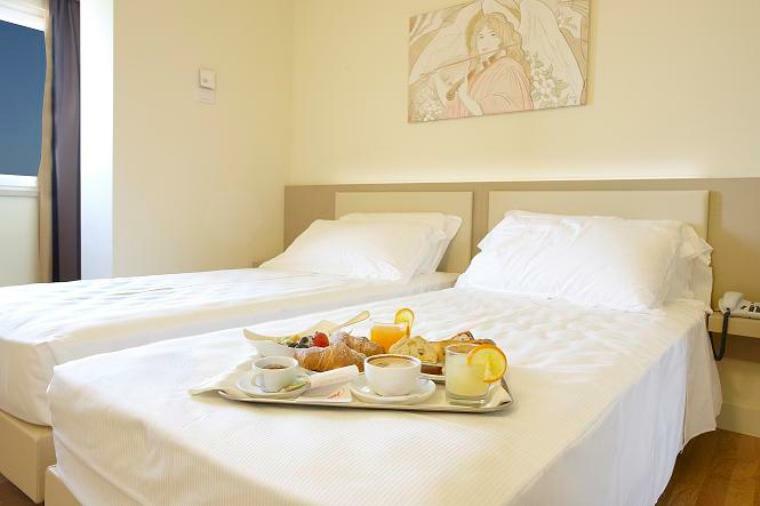 B&B is located just a 5 minutes walk from Santa Maria delle Moie. It is one of the most beautiful Romanic abbeys in all Le Marche. 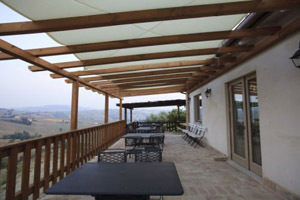 Agriturismo L’Ulivo is located in a hilly setting surrounded by century old olive trees. They give the name to the structure. It is composed of two old farms recently restored: Casa sul Colle especially thought for guests where it is possible to taste the products of the farm and Cascina del Tufo further downhill. A delightful gate marks the entrance of this unexpected and charming world: the entire place oozes serenity; the welcome from Signora Gioia and her kindness make every moment perfect. Roses and flowers frame every corner, whilst the green of the lawn connects the villa with the swimming pool and leaves space for the beach and the crystal clear water. Welcome to the inviting and refined Villa Mirella Beach. Residence Crirò has been recently built. It has been provided with all modern comforts. It is close to the sea and from the terraces of each lodging it is possible to see the hills and the mountains around. Its position is perfect for those who are looking for a quiet place to stay, whilst being close to the facilities and the many opportunities for fun and entertainment typical of seaside resorts. An ochre yellow farmhouse located just a short way from the medieval village of Massignano. The place and the owners offer a mix of different cultures. Freshly baked bread, home made jams and cakes for breakfast. In an oasis of peace, intense colours and warm perfumes of the Verdicchio land You will be welcomed by the warmth typical of the locals, and the siblings Anna & Francesco will be pleased to host you in Casa Rastia. La Villa Collepere è un’esclusiva country house nel cuore delle Marche. Immersa nel verde della campagna di Matelica, questa Villa offre al visitatore una piacevole tranquillità e la facilità di scoprire tutta la regione. La struttura abilmente recuperata da un casino di caccia del XVII secolo, è stata immaginata per fare trascorrere piacevoli momenti. Ancient, quiet and surrounded by nature. These are the characteristics of Tiglio Country House. The outlook has been preserved throughout the years. The ancient farm house stands in fact among linden trees and pines. The place is quiet and special. 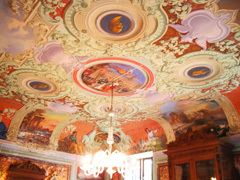 Villa Castellani was once devoted to make traditional dishes adding modern flavours. Villa Castellani is now a structure that welcomes its guests in carefully furnished rooms. The elegant furniture is framed by the quiet and beautiful panorama outside. A peaceful balcony on the Sibillini mountains close to the marvelous and lively village of Montalto delle Marche. The Agriturismo Il Sentiero offers four nicely furnished apartments: Il Vigneto, Il Pescheto, I ciliegi, La Quercia. Agriturismo Poggio Montali is perched on a hill. A picturesque road lined by oak trees takes to it. The farm house is surrounded by vineyards and olive groves. The place boasts a beautiful view on vineyards and on gentle hills that stretch as far as the coastline. 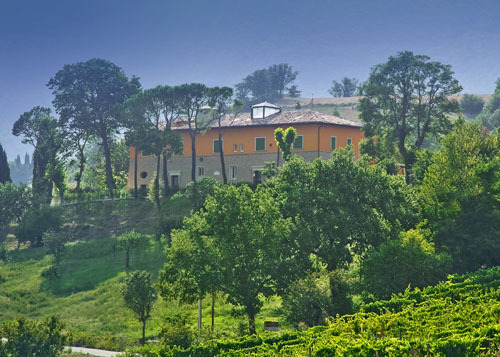 La Collina delle Streghe was opened in 2005 in the core of an organic farm. It is located on the border between Castelbellino town and Monte Roberto. The place is perfect to enjoy pleasant days surrounded by nature and close to the fortresses and castles of Jesi. A period farmhouse in the heart of the Verdicchio country, tastefully converted into two independent apartments whilst preserving most of its original features. Both apartments are furnished in traditional country style and enjoy panoramic views over the hills. An old country house dating back to 1895 located just a short way from Montecarotto has been recently restored by Rossano Landi. It has been turned into a cosy home to relax and taste genuine local delicacies. All the traditional food is in fact made with organic products cultivated in the farm nearby. The Azienda Agricola Fausta Sinistrario is the core of a large estate (100ha). It is located in the very heart of the hilly Marche countryside. It is a perfect starting point to visit famous and wonderful cities such as Loreto and its famous Sanctuary devoted to Virgin Mary, Recanati, birthplace of the well known poet Giacomo Leopardi. The wonderful Conero coastline is just a short drive off. 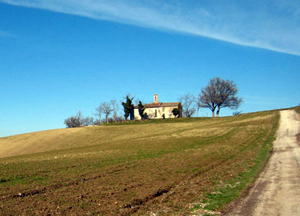 The enchanting farm house hosting the B&B Patrizia D’Ercoli is just a short way from Montefiore dell’Aso. This town is a typical medieval village of Le Marche inland. It is rich in Arts and History. The B&B is surrounded by all kinds of beauties: there is a pond and a wide garden. On summer mornings breakfast is served on a picturesque balcony. There the view of the sea (East side) and the mountains (West side) is enchanting and so is the feeling of being embraced by Nature itself. In this charming seventeenth-century residence, the rooms look out onto the Metauro Valley and its green hills, while the guests discover the joy of spending time beside the pool and in the elegant communal spaces. It is the perfect starting point for discovering the surrounding area, a place that is halfway between the sea and the countryside, with breathtaking scenery and spacious green areas. Shanti House gently sits on one of the hills that surround Morro D'Alba, offering prime position from which to admire the view of the local medieval village, enjoying the deafening silence of the Marche countryside, its vineyards and olive groves. Immersed in the Conero Park's breathtaking countryside and only a stone’s throw away from the coast, the residence is found within the grounds of the elegant Villa Virginia which dates back to the 18th century, and is surrounded by its famed abundance of chestnut trees. For those that love the sea, whether it’s during hot sunny days or beautiful winter afternoons, Hotel Giardino is a safe haven of an intimate size in which one finds all the desirable comforts and a new wellbeing centre. The hotel – immersed in Conero Park and a short distance away from the stunning villages of Numana and Sirolo, and from the private beach – offers both hotel accommodation and self-catering accommodation. The Agriturismo Vecchio Gelso (old mulberry tree) takes its name from the century old mulberry tree you will see right at the entrance. The place offers all comforts in the bedrooms and a swimming pool and children playing area. The meals are all made following the most typical Le Marche tradition. The inn looks out onto the castle walls of Ortezzano, a small centre with a medieval past in the heart of the Piceno area, the territory with the original name of its first dwellers of historical epoch. Therefore the name “I Piceni” was not chosen by chance, neither was the choice of the symbolic decoration shown inside and outside the inn. With the idea of evoking the epics of the ancient Italian population, bellicose but at the same time convivial. Agriturismo Azzurro has been named after the light blue colour of the structure. It is set in the countryside, The atmosphere is quiet and relaxing there. The farmhouse is located not far from Osimo, a city of roman origins. Collina di Abbadia is a cosy and welcoming B&B. It is located in panoramic position on the hills around Osimo. It is just 10 minutes from the seaside and close to naturalistic and artistic places. A large country estate, offering farmhouses and sporting facilities scattered up the hillside and around a natural terrace with spectacular views over the Marche countryside, San Settimio Country Club offers evenings of fun over a glass of good Verdicchio wine produced on the estate and the opportunity to taste traditional Marche dishes, prepared with fresh organic ingredients from the farm. MES is set in the countryside. A special atmosphere pervades the place. It helps discovering – or rediscovering – a closer relationship with nature and earth itself. There are several leisure activities to choose from: from swimming to archery, from cookery to walking in the woods. It is also possible to purchase the organic products grown in the farm. Situated in a quiet panoramic area, surrounded by woods and meadows, the country house offers 4 independent apartments, each with its own kitchen and bathroom. Outside, there is a large garden with barbecue, gazebo and a swimming pool for spending peaceful days in the open countryside. Agriturismo Il Melograno is framed by the gentle hills of Le Marche. It is located in the core of the countryside around Ponzano di Fermo. Daniel and Candida will be glad to welcome you in the cosy country house with swimming pool. You will be delighted by the fabulous wood around and well kept fruit orchard. Healthy breakfasts will help better start your day. A special holiday on a “brigantino” which sails on a beach entirely available for you, on the sea, to live an unforgettable stay on the Adriatic Coast surrounded by the comfort of well-being sensations for you and the entire family. Located in an area of astonishing beauty and dominating the northern side of the Conero coast, Hotel Emilia offers amazing views, elegance and refinement to its guests. Food has a definite local flavour here, being mainly composed of traditional recipes handed down by Grandma Emilia. Rising in the quietest and most panoramic part of the Conero riviera, an ancient fortress situated in a beautifully picturesque position between the green of the woods and the blue of the sea. Steeped in the greenery of the Conero Park, where Mount Conero slopes into the sea, amidst the emerald greenery, appears the Excelsior Hotel La Fonte. An oasis of peace and tranquillity for holidays, for relax, where even conventions and congresses turn into pleasant tourism. In the Conero Park a special holiday can be enjoyed at Old farmhouse Emilia, a country house furnished in a simple rural style. 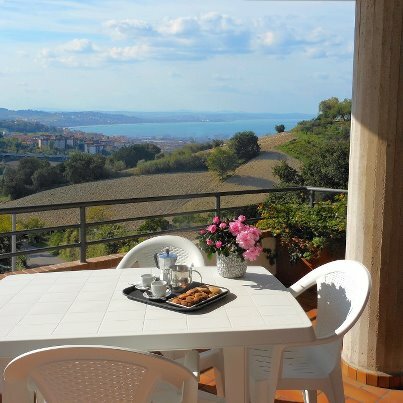 Its position offers excellent panoramic views over the gentle hills and the Conero mountain on one side and the intense blue of Adriatic sea on the other. Like an ancient lighthouse , La Torre (the Tower) rises above the sea by the crystal waters and the rocks of the shore of Portonovo, elegantly and discreetly dominating an enchanting landscape of deep greens and blues. An ideal holiday for those who truly love the sea in every season, far from the enticements of luxury and comforts. Casale del Baco is an ancient farm house dating back to 1800. The building has been recently restored but has preserved the typical silk mill shape. It has now been turned into a Country House to better exploit the origins of the place. The Country House Vittoria Il Graditempo is located in the core of Le Marche countryside. It is just a short way from the Gola della Rossa park and Frasassi caves. It is a special place from where to start to visit the Mediaeval hamlets in Castelli di Jesi area. 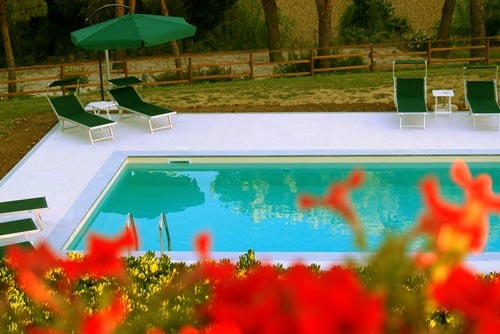 The Country House La Sorgente del Sole is located in the charming green hills. The Country House is dipped in the silence of the nature where your glance can go till the horizon and discover closed castles, colourful country villages, dawn and sunsets like postcards and infinites sunflowers’ fields. The Montanaria Tourist Centre consists of a modern, well-appointed holiday village which had been created with complete respect for environmental and architectural considerations around a restored farmhouse. Case per Vacanze Il Glicine and its welcoming atmosphere is close to a spa and to Sarnano town centre. The town dates back to the Medieval times and it is perched on a hill looking at the North-West side of the Sibillini mountains. Finis Africae lies surrounded by green hillsides, a short distance from one of the most beautiful beaches in Le Marche: the velvet sands of Senigallia. Excellent features and comforts combine effectively with the warm and inviting ethnic atmosphere, treating you to a break of total relaxation in the rolling hills of Le Marche. A polyfunctional complex for holidays and cultural & entertainment activities that Silva, its creator, realized on the gentle hills near the beach of Senigallia when she came back from her numerous trips in the Far East, bringing with her precious souvenirs. Coquus Fornacis is a unique place in the core of Le Marche countryside. It is a restaurant and a B&B set in an ancient brick-kiln completely restored. Its cuisine is refined and the bedrooms are cosy and elegant at the same time. A lovely Bed & Breakfast under Le Copertelle, ancient arches near the wall of the medieval village. The cosy atmosphere of B&B La Calanca is overlooked by an imposing ‘calanca’ and is surrounded by unspoilt countryside and sweet animals. The tinkling of bamboo knick-knaks beautifully placed on the tree branches will see you off to the entrance. Casale di Giulia is an old cottage built in the beautiful white stone typical of the Conero area. It’s recently been transformed into an elegant and welcoming country residence having been designed with great passion by its owners. The house is situated in the heart of the Monte Conero Regional Park, adjacent to Sirolo’s Conero Golf Club and just five minutes from the sea. 10% Discount - Book Now! Treia is a city of ancient glories and epic battles. The town is perched on a hill in a dominant position that still deserves a feeling of awe from the observer as in Medieval times. Open spaces, gentle hills covered in olive groves and wheat are a true paradise possible that gladdens the souls and help relaxing. Just next door to a sombre fifteenth century “pieve” or parish church, in such a splendid position on the landscape that it attracted the attention of Piero della Francesca, who used it as a point from which to paint the truffle-filled valleys, you will find Pieve Del Colle: an organic farm, education centre, restaurant and guest house. If you stop here for a break or refreshment, you are bound to leave with wonderful memories. An agritouristic complex located in the green Candigliano Valley, where farming is still very active. It includes an old farmhouse and a small farm operated by the owners.